DANISH shipping giant Maersk Line say four seafarers are now confirmed to have died in the fire onboard the Maersk Honam as the remains of three of four crew missing are found onboard the vessel. The shipping line said that the three bodies found on the vessel were as yet to be identified. 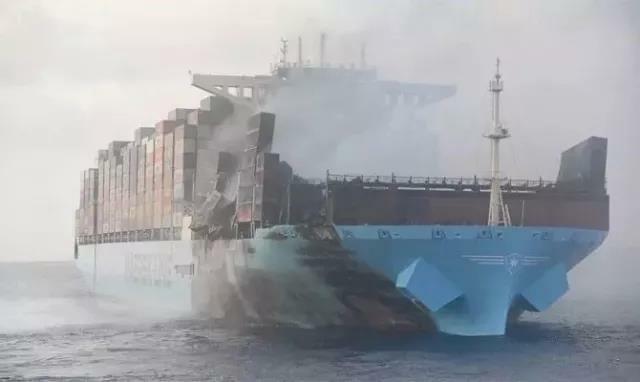 Given the severe fire damage to the 15,252 TEU containership Maersk said: “We must conclude by now that we have lost all four colleagues who have been missing since the fire onboard Maersk Honam began on March 6.” That would bring the death toll from the blaze to five. “Our most heartfelt condolences go out to families of our deceased colleagues. We share their sorrow and do our outmost to support them in this devastating time,” said Maersk COO Soren Toft. The Danish shipowner said a thorough search of the vessel was continuing and it said firefighting operations were “progressing”. The fire was reported to have been brought under control last Saturday. Of the 22 survivors all have received medical treatment and the majority have been released from hospital. Maersk said that seafarers that had been in intensive care had been moved to a general ward and were recovering well. The India Marine Police is conducting an investigation into the fire, reports Seatrade Maritime News of Colchester, UK. The crew evacuated the Maersk Honam in the Arabian Sea on Tuesday last week after they failed in efforts to bring the fire under control. The Singapore-flagged Maersk Honam was on enroute from Singapore to Suez with 7,860 containers, equalling 12,416 TEU, onboard at the time of the fire.